These elegant statement matt silver aluminium heart earrings on long earwires are lightweight and perfect for accessorising your day to evening look. Showcasing beautiful British workmanship our jewellery is cut, domed and finished by hand. Designed and made in our workshop in Wales. Supplied with gift packaging. To make this piece we use aluminium remnants to upcycle into beautiful jewellery as an environmentally friendly alternative to silver. When you place your order from us the jobsheet is taken through to the workshop and given to one of our 4 jewellery makers who will use a punch and die to carefully cut the hearts from the tin. The piece is carefully sanded with a fine textured emery block and a small drill is used to make the hole for the earwires. After this process the piece is assembled by another maker who adds the sterling silver earwires. Finally it is carefully checked, wrapped and posted. We recycle our plastic, card, glass & paper. We also recycle all our off-cuts of tin and aluminium. We use local companies for our printing, packaging materials, tools, stationery and consumables which saves road miles! Our card gift boxes are supplied by eco-craft, a British company specializing in recycling materials. We source as many of our components as possible in the UK, saving air miles! Our silver jewellery findings are from British companies. Please take care of your jewellery by polishing silver with a silver cloth and keeping tin pendants away from water. 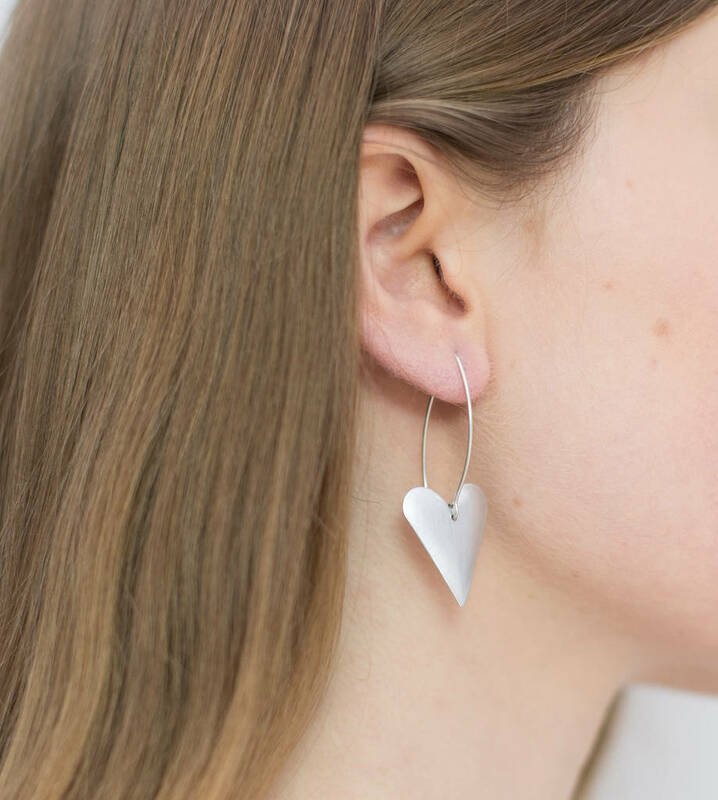 Your jewellery will be made to match as closely as possible this photograph, but as our jewellery is handmade and from upcycled aluminium, please allow for slight variations in design. Presented in a beautiful UK made recycled card pouch. Each heart measures 20mm x 25mm. earwire is 30mm long so total length of earrings is approximately 55mm. This product is dispatched to you by Kate HH Studio.